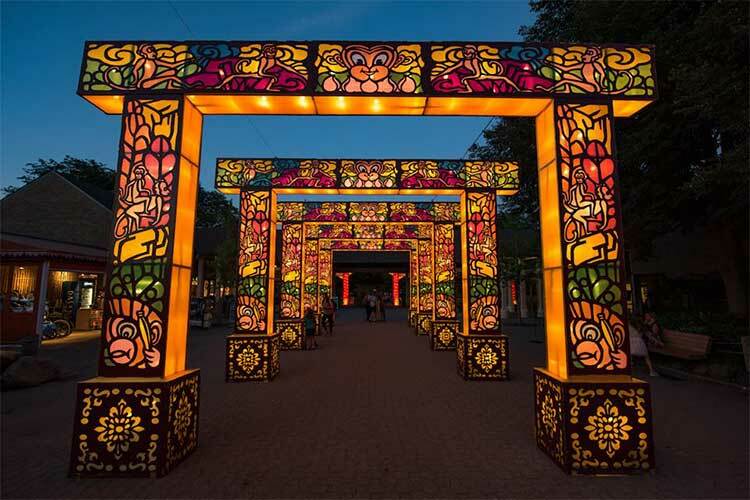 Originally slated to close yesterday, the Cleveland Metroparks Zoo’s Asian Lantern Festival has been such a popular attraction this summer that the Metroparks decided to extend the luminous, intricate exhibit that winds through the lower zoo ground for two more weeks through Labor Day weekend. Brought to Cleveland with the help of Chicago-based Tianyu Arts and Culture (a subsidiary of Sichuan Tianyu in Zigong, China), the festival includes 40 attention-grabbing lantern displays, a craft market, and live acrobatic and juggling performances. “It’s a very nice experience after dark,” says Manderfield of the brightly glowing lanterns. “Each lantern has a name and a story behind it.” She cites one display—a zodiac circle in which visitors can find the animal associated with the year they were born and the story behind that animal—as one of the tour's greatest hits. Authentic Asian food and drink is also part of the attraction, with ramen noodle bowls, Korean BBQ sandwiches, and traditional Asian beer among the offerings alongside the ongoing Kiko's Kitchen stand in the Asian Highlands exhibit. At the craft market, visitors can buy handmade Chinese keepsakes and have gifts personalized by Chinese artisans, while nightly performances include a performance by a juggler who uses her feet. Additionally, local filmmaker, event producer, and Media Design Imaging owner Johnny Wu has been performing on Saturday nights with his team of drummers and dragon dancers at the festival, but Manderfield is still unsure whether they can return for the extension. Additional performers will be added on Saturday nights for the duration of the exhibit’s extension. It was no small task to stage all the grandeur of the Asian Lantern Festival. Through Tianyu Sichuan, approximately 40 craftspeople, artists, and performers came to Cleveland from China to build the exhibit, perform, and sell crafts at the market. Putting a 600-pound head on a 20-foot-high dragon is no easy feat.The entire group arrived in mid-June to begin work, according to Manderfield. 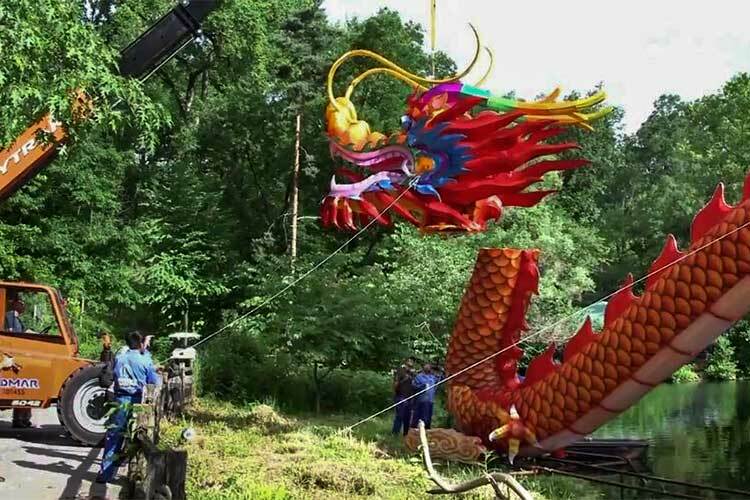 The group of 35 lantern makers worked with Metroparks staff to collaborate on constructing such spectacles as the 200-foot long, 20-foot high dragon lantern along Waterfowl Lake. According to Manderfield, it took the team about a week to construct the dragon, which includes a 600-pound head. Most of the crew has returned home now, but a dozen remain to make repairs to the lanterns and help with upkeep. When a power outage on Saturday, August 11, caused the closure of the exhibit (a special Saturday, September 8 rain date has been set for those who had tickets), many of the staff visiting from China took the opportunity to walk around the zoo and check out the sights, says Manderfield. While in Cleveland, the Chinese crew were able to secure rental housing in Old Brooklyn through Cleveland House Hotels (a Cleveland Chain Reaction finalist).